When LUPETTA sent me a selection of their products to try I knew I what I wanted to make. Having made a rather tasty wholemeal wreath recently, I had also spotted a Stromboli recipe on the Baking mad website. I changed the stuffing to suit my tastes and we used the Lupetta olive oil and balsamic vinegar as a dip for the bread too. I started by making the bread. Here I used 500g of strong white flour, a packet of Allison's yeast, 2tsp salt, 1tsp caster sugar, 50ml of LUPETTA Olive oil and 300ml of warm water. I mixed this altogether. kneaded for 5 minutes and then left it to rise. For the stuffing, I sliced some orange pepper and red onion and fried this in a pan to soften. 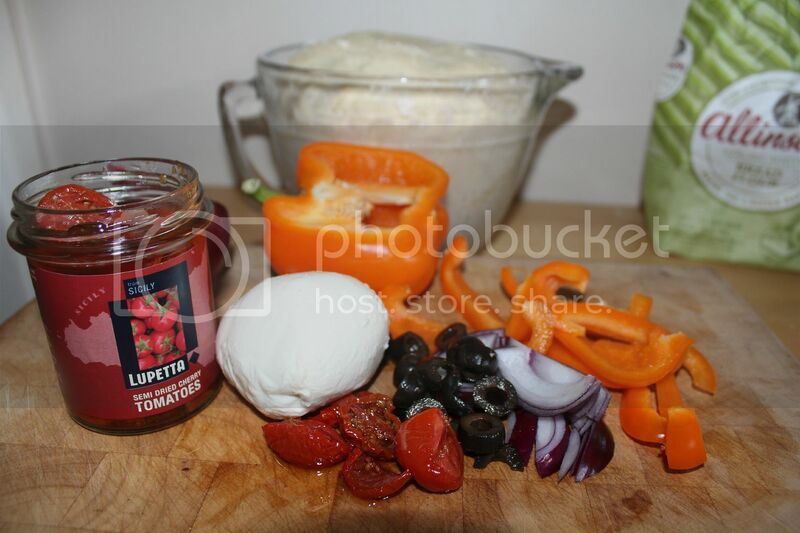 I rolled the bread into a rectangle and placed the peppers, onions, Lupetta semi dried cherry tomatoes, black olives and half fat mozzarella in the middle. I then folded over the bread and cooked for around 30 mins at 200C. I served the bread with a balsamic vinegar and olive oil dip and macaroni cheese. 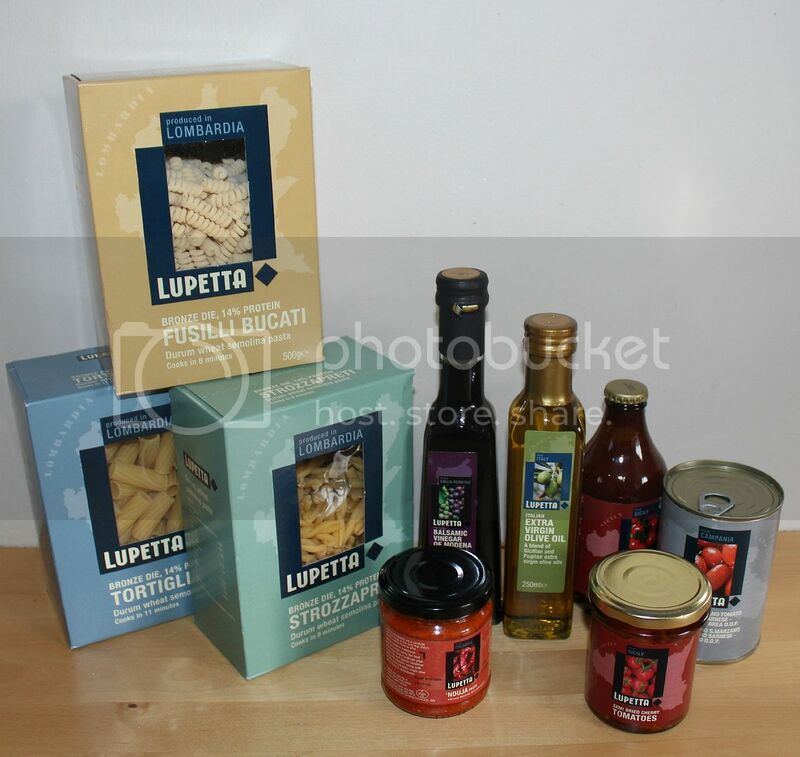 I really enjoyed the products we received and LUPETTA have kindly offered one of my readers the chance to win a selection of their products too. Just complete the Gleam entry below. Good Luck! The dried tomatoes on a pizza. The Fusilli Bucati, I would love to try. Would love to try the different types of pasta and make some new meals for my lot as they love pasta. I would like to try your recipe for stuffed stromboli. Would also like to try the tomatoes with a fish dish. Those pasta shapes look perfect for a creamy sauce, and maybe some roast peppers with the olive oil. I would make a Carbonara. The Fusilli Bucati, I would make a simple pasta sauce to pour over it. I'd love to try the olive oil to drizzle over a nice summer salad, pasta or pizza yum! The pasta, perfect with pesto and Parmesan. The pasta which I'd have with pesto sauce - simple but very tasty. I'd love to try the olive oil, and I would make the Stromboli dough that you made, but instead of filling it with vegetables as you did, I'd make a dessert variation with peaches, fresh black cherries and strawberries. A pasta salad to celebrate the Spring sunshine !! I'd use the sundried tomatoes and pasta. I'd heat some olive oil in a pan, add thinly sliced smoked ham cook for a few mins then add the chopped sundried tomatoes and some pine nuts and heat through. Serve over past - it's quick and delicious! I would use the Fusilli Bucati pasta and make a big pasta bake for the kids tea! One of their favourites! I would use the balsamic vinegar as a lovely dip. The balsamic vinegar would be great. I love it on its own as a salad dressing. The better quality the vinegar the richer the dressing. Mmmmmm. Think I'd make some home made pesto and sun dried tomatoes and have it with the fusilli pasta. I love pasta sauces using different pasta added all sounds lovely big italian food fan so would love to experience all the products come up with interesting recipes to try all look so fab. I would make Strozzapreti With Andouille, Peppers, and Tomatoes and I would love to try the Lupetta Strozzapreti and the semi dried cherry tomatoes, also the olive oil nom nom nom ty for the chance! Hardly ever find anything Italian I do not like!! Gellato. Oh yeah. Savoury Italian food isn't bad either. Never tried this brand. The sun dried tomatoes, I'd put it in pasta sauce. The Sun-Dried Cherry Tomatoes and i'd make a delicious toastie with those and mozzerella cheese! I would use the pasta to invent a new pasta bake. I like the gift box idea. sun dried tomatoes for a home made pizza. Those sun-dried cherry tomatoes look devine ! Ooh the EVOO to make a focaccia! I'd like to try the sun dried tomatoes and try this bread recipe! The pasta with the sun dried tomatoes... perfect! i would make a caprese sandwich! I like so pizza too home made is just so much better ! I'd like to use the balsamic vinegar and olive oil to make a salad dressing. 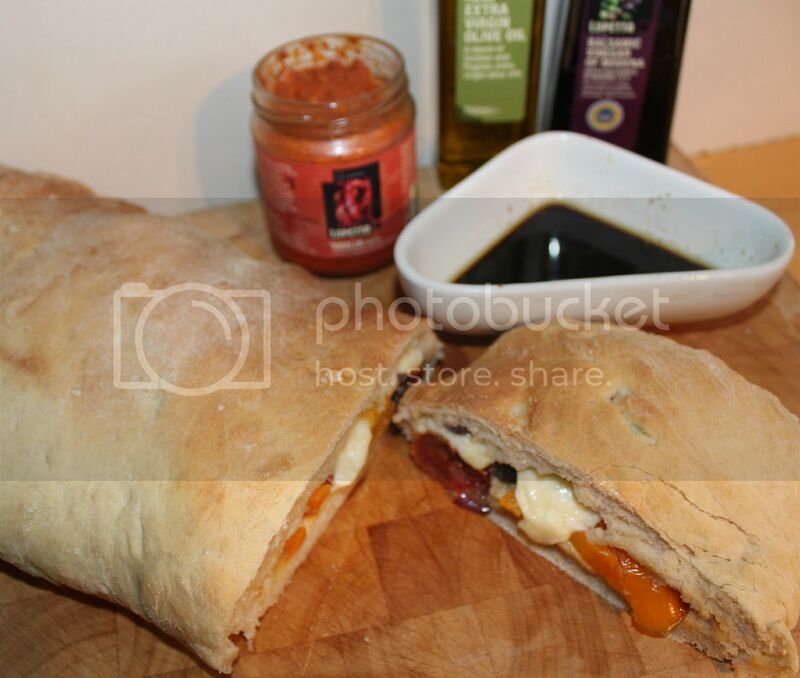 But that stromboli looks amazing. I would love to try the pasta and make one of my chicken pasta dishes. I would love to use the sun dried tomatoes in a spag bol! 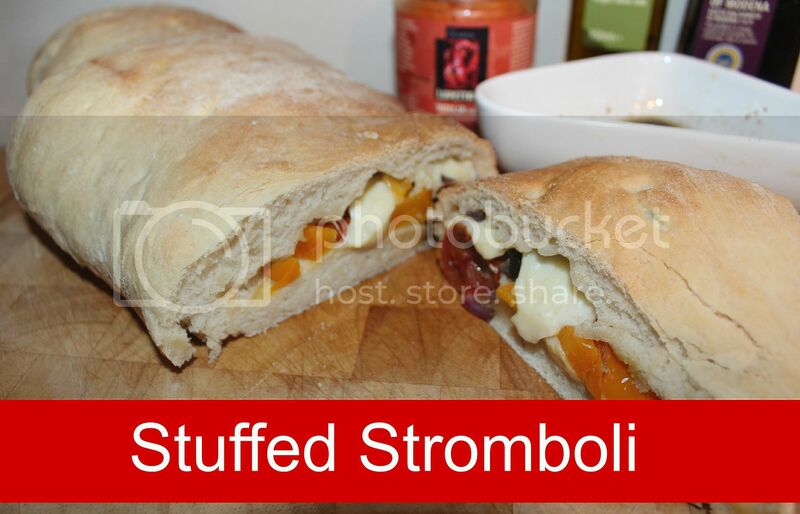 Love to try Stuffed Stromboli. The sun dried tomatoes for sure. The Fusilli- we are a family of pasta eaters!!! Sun dried tomatoes as they'd go well on a pizza! The Balsamic Vinegar, would make a dip with olive oil for my focaccia bread with rosemary. i would like to try the sauces. The balsamic vinegar to add to my homemade tomato sauce and the virgin olive oil for my hair! I would probably make a delicious tuna pasta bake with the fusilli bucati. Nice and simple. Pasta with tomatoes and fresh parmesan and basil. I'd use the balsamic in all my dressings, drizzles and dips! I'd like to try the fusilli bucati...it looks so curly! Perfect for a vegan pasta bake with sweetcorn, leeks and fake smoked bacon. The Strozzapreti, not a variety I have had before and would love to try! I'd make a tomato sauce, so would use the tomatoes too! Oo sun dried cherry tomatoes, they would make my work salads taste amazing!! Balsamic vinegar with olive oil, yum! The Balsamic Vinegar which I would mix with some Olive Oil and dip french bread into.